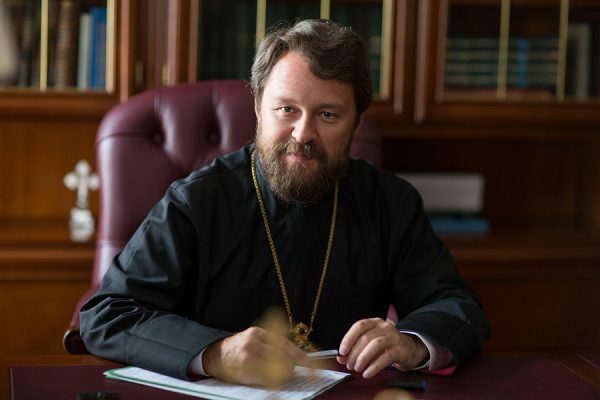 During his stay in Athens, Metropolitan Hilarion of Volokolamsk, head of the Moscow Patriarchate department for external church relations, gave an interview to the Greek Romfea new agency. – Your Eminence, in these days you are visiting Greece. What problem will be discussed at your meeting with the Primate of the Greek Orthodox Church? – Whenever I come to Athens, I meet with His Beatitude Ieronymos, Archbishop of Athens and All Greece. We will deal with both the relations between the Russian and Greek Orthodox Churches and the inter-Orthodox agenda since a great deal of issues have accumulated that need to be discussed. I would like to tell His Beatitude Ieronymos about the situation in Ukraine and the difficult situation in which the canonical Orthodox Church there has found itself. I will speak of the same matter at the Inter-parliamentary Assembly of Orthodoxy. It is very important that the Primate and hierarchs of the Greek Church as well as the public at large be aware of the real picture of what is going on in Ukraine and know that the canonical Ukrainian Orthodox Church, which is the majority Church in Ukraine, is subjected today to discrimination, persecution and unprecedented pressure by the secular authorities in that country. The pressure has as its aim to make the canonical Church accept the state-initiated project for creating ‘a one local church’ in Ukraine. The way in which this project is conceived by the Ukrainian authorities, it is unfeasible and extremely dangerous for the Church since its idea is to tear the canonical Ukrainian Orthodox Church away from the Moscow Patriarchate and to incorporate it into two schismatic structures. In addition, the Uniates are said to have joined the project. The Uniates are interested in it since, according to them, this one church ‘should be in unity with the successor of St. Peters’, which means that it will no longer be Orthodox but Catholic. It looks as if we are returning to the situation as it was in 1596 when the authorities of the Polish-Lithuanian State forcibly converted Orthodox people to the Unia. As I have already mentioned, standing behind the project of ‘a one local church’ in Ukraine are three forces: the Ukrainian authorities, the schismatics and the Uniates. Each of these forces has an interest of its own. The Ukrainian authority’s interest is to find a topic that will help it to hold out until the elections and win them, which appears almost unlikely, considering the extremely low rating of the leadership in force. The schismatics are interested in this project since they thus may legitimize all that they have done during the last 25 years. And the Uniates hope to use this project to weaken the Orthodox Church and to move the Ukrainian Orthodox faithful into the Unia. – Your Eminence, the recent visit to Fanar by a delegation of the canonical Ukrainian Orthodox Church has aroused a special interest. Is anything known about this meeting? Can it be called a right step? – Two days ago, a delegation of the Ukrainian Orthodox Church visited Fanar. It included four metropolitans – Agafangel of Odessa, Hilarion of Donetsk, Feodor of Kamenets-Podolskiy and Antoniy of Borispol. The talk, in which the Church of Constantinople was represented by Patriarch Bartholomew, Metropolitan John of Pergamon, Metropolitan Emmanuel of France and Metropolitan Bartholomew of Smyrna, lasted for six hours. During this time, the parties set forth their visions of the situation. Metropolitan John of Pergamon, in particular, addressed the events traced back 300 years, when the Metropolitanate of Kiev was incorporated in the Moscow Patriarchate, and began developing a theory whereby this transfer was of a temporary nature, and the Metropolitanate of Kiev, according to the decision of then Patriarch of Constantinople, was to be installed in Moscow while being subordinate to the Patriarch of Constantinople. Recently, we have worked much in the archives and found all the available documents about these events – 900 pages in both Greek and Russian. They quite clearly show that the Metropolitante of Kiev was included in the Moscow Patriarchate by the decision of the Patriarch of Constantinople, and the temporary nature of this decision is not stipulated anywhere with no date specified. None of these documents states that the Metropolitanate of Kiev is handed over to the Moscow Patriarchate for ten years or twenty years or one hundred years. Never in the past three and a half centuries has the Patriarch of Constantinople challenged the membership of the Metropolitanate of Kiev in the Moscow Patriarchate – neither Patriarch Demetrios nor his predecessors nor the present Patriarch Bartholomew until recently. Furthermore, it should not be forgotten that the Metropolitanate of Kiev at the moment when it joined the Moscow Patriarchate was much smaller territorially than the present Ukraine. There was no Odessa or Donetsk or Crimea in it. Accordingly, the present Ukrainian Orthodox Church of the Moscow Patriarchate is a completely different territory from the one that was incorporated at that time. Precisely this Ukrainian Orthodox Church is the one canonical Local Church of Ukraine. There is no need for creating a new ‘local church of Ukraine’ when there already is the Local Church in Ukraine. This Church has over 12 thousand parishes, over 200 monasteries, and it units millions of the faithful throughout the territory of Ukraine. And it has not asked for autocephaly. The episcopate, clergy and laity of this Church are against autocephaly, which has been very convincingly re-affirmed by yesterday’s Bishops’ Conference, which took place in Kiev on July 25 – the name day of His Beatitude Metropolitan Onufry of Kiev and All Ukraine, for which hierarchs, over 70 of them, came from all over Ukraine. Having heard a report of the four metropolitans about their trip to Fanar, they adopted a statement. I hope that the Greek world, too, will learn about this statement through your esteemed new agency. I have not seen this text because it has not been published as yet but I have heard from Ukrainian hierarchs that the statement affirms the need to preserve the present status of the Ukrainian Orthodox Church. And this reflects the position taken by the faithful, clergy and episcopate of the Ukrainian Orthodox Church on this matter. – What you have said, Your Eminence, is very convincing. In conclusion, I would like to ask you one more question. Schismatic Philaret once said that he was going to take the Laura as well as soon as the above-mentioned design is realized. How would you comment that? – Philaret Denisenko has deceived people in various ways for 25 years. Now he is suggesting people an idea that the Patriarchate of Constantinople will grant autocephaly to his structure in already a day or two, while maintaining that nothing lower than a patriarchate, of course, neither a metropolitanate nor an archdiocese, will suit them. He says, ‘I am Patriarch and I will remain Patriarch’. It seems to be the main thing he takes an interest in – that a patriarchal cowl he has put on unlawfully not be taken away from him. And he also says that as soon as this new church structure is created, the Kiev Laura of the Caves and the Laura of Our Lady of Pochayev should be transferred to it. You surely understand that the faithful will not give up the Lauras. Today some 50 churches of the canonical Ukrainian Church have been unlawfully captured by the schismatics; violence has already been used against the Orthodox faithful. And imagine what will happen if the schismatics begin seizing the Lauras. Thousands of people will get together to defend the monasteries; blood will be shed. Who will be responsible for the bloodshed? Therefore, I think, by no means should it be allowed. I believe the very important fact of the talk that took place at Fanar is that Patriarch Bartholomew underscored that for him a schism is a schism, and he sees in Philaret Denisenko an initiator of a schism. In addition, Patriarch Bartholomew said that those who are spreading the allegation that a Tomos of autocephaly has already been written are enemies of the Patriarchate of Constantinople. This allegation was voiced on the Ukrainian TV Pyatyj Kanal by an archimandrite close to certain circles in the Church of Constantinople. He said that the Tomos has already been written and its author is ‘a Greek canonist of genius, a professor from the University of Athens’. This information has certainly come as a surprise in Ukraine but Patriarch Bartholomew has very clearly stated that there is no tomos, and those, who maintain there is, are enemies of the Church of Constantinople. All the parties of the process should be aware of their responsibility for what is going on now and for what will happen. A delegation of the Patriarchate of Constantinople is making a tour of Local Orthodox Church to find out their attitude to the idea of granting autocephaly to the Ukrainian Church. On July 9, the delegation will come to us in Moscow. We will certainly hear out the arguments they will present. I think the most important thing is that our two Churches, of Constantinople and of Russia, should begin a full-fledged dialogue. In my opinion, a distant exchange of opinions going on in recent months, including through the mass media, is an unsuitable way of solving the problem of the Ukrainian schism. I think the best way is to enter into negotiations. It seems very important to me that Local Churches should show the solidarity as a guarantee of the unity of the Orthodox Church. Any support for the schism may undermine this unity; what is more, a support for the schism in one place will immediately encourage schismatics in other places to raise their heads. The Russian Orthodox Church, no less than the Church of Constantinople, is interested in bringing schismatics back to the fold of the Church. We believe that the way for the schismatics’ return is open. Moreover, just last December, Philaret Denisenko appealed to the episcopate of the Russian Orthodox Church headed by Patriarch Kirill to forgive each other’s sins of the past and to embark on the path of dialogue. Our Church responded to his letter very positively. But as soon as it became known, somebody checked Philaret and the following day he publicly disavowed all that he wrote in his letter. It means that in Ukraine there are forces who do not wish that the schismatics should return to the fold of the Church in a canonical way, but on the contrary, wish to legitimize the schism. At his meeting with the four Ukrainian hierarchs, Patriarch Bartholomew very clearly stated that there will be no legitimation of the schism whatsoever, and it is an important statement. I very much hope that the problem of the Ukrainian schism will be solved only canonically. I hope that the decision of the Patriarchate of Constantinople on this matter will not be based on the conception set forth by Metropolitan John of Pergamon – a conception based not on a real knowledge of the situation but on a one-sided and biased reading of the sources traced back 300 years. – Thank you, Your Eminence, for so excellent a talk. – And I thank your and with you success in the important task you have carried out for all these years.